Welcome to the fifth edition of Glamour & Grammar, the blog series in which I address grammatical failures in pop culture. Sure, she looks like a real-life Disney princess, and, yeah, maybe she has dimples for days. And, I mean, I guess her bouffant hair would make even Brigitte Bardot jealous. And, okay, I'll concede that she can sing like Mariah freaking Carey. But, y'all, we can criticize Ariana Grande for her grammar, which—as evidenced by her current chart-topper "Problem" (feat. something called an Iggy Azalea)—needs some serious work. "Head in the clouds, got no weight on my shoulders / I should be wiser and realize that I've got one less problem without you / (I got one less, one less problem)"
Ahem, one fewer. 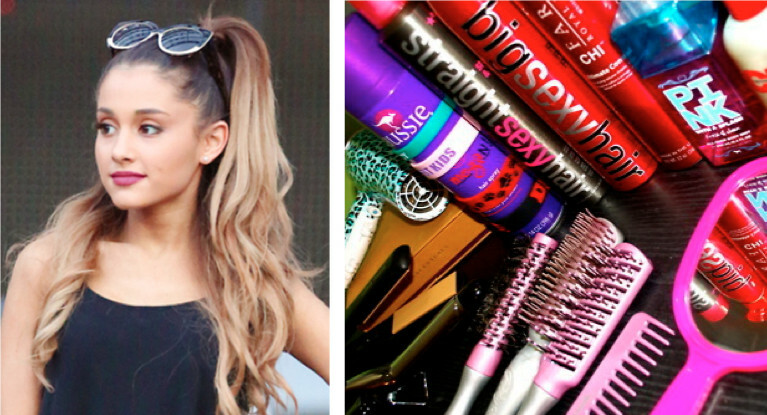 You have one fewer problem, Ariana. If Ariana Grande had one fewer problem, she might not have any problems at all. Food for thought. Some grammar rules are rather complicated (see pronoun placement), but less vs. fewer is not one of them. Here's the whole rule: "Fewer" is used with countable nouns, and "less" is used with uncountable nouns (a.k.a. mass nouns). What are countable nouns? Glad you asked. THEY'RE NOUNS YOU CAN COUNT. And uncountable nouns? You guessed it—NOUNS YOU CAN'T. Fewer bobby pins. Less volume. Fewer fans. Less fame. Fewer problems. Less stress. If you can't identify immediately whether a noun is countable or uncountable, ask yourself whether you would preface that word with "many" (countable) or "much" (uncountable). How many bobby pins? How much volume? How many fans? How much fame? How many problems? How much stress? Some words can function as both uncountable and countable nouns. Take, for example, "hair product," which usually refers to specific individual products (countable) but—especially if you are a hairdresser on a makeover TV show—can also refer to the actual hair gunk itself (uncountable). Could you get that pouffy pony with less hair product...or fewer hair products? Another way to know whether a noun is countable is to try putting a number in front of it. One problem, two problems (red problems, blue problems). If a word works with a number, it's countable and should be paired with "fewer." This is why "one less" is always wrong. I still love you, Target. 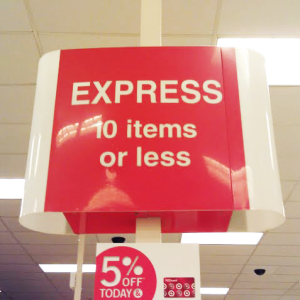 This is also why express lanes get it wrong when they say "10 items or less." I've heard it argued that "or less" is just fine because it's referring to an amount of stuff rather than a number of things, but that's a self-defeating argument because, at least in my opinion, 10 IS A NUMBER. Time: "Fewer Less than two weeks until the Ariana Grande concert." Money: "Ariana Grande tickets cost fewer less than $50." Distance: "I'm standing fewer less than 20 feet from Ariana Grande." If your intention is to express a single amount of time, money, or distance rather than to enumerate the individual units that make up that amount, then "less" is the word you want. The other exception to this (and every) rule is Iggy Azalea herself, whose grammar I'll refrain from correcting. She can't worry 'bout no haters.